Market Rasen Town FC suffered their heaviest defeat of the season as Lincoln Railway chalked up double figures in the Lincolnshire League on Saturday. Six-shooter Simon Mowbray scored a double hat-trick as the Railmen leapt to fifth place. George Zuerner grabbed a brace of goals and Elliott Dye was also on target for the home side, while an own goal compounded Rasen’s miserable afternoon. Things are getting tight among the chasing pack in the league with just six points separating the nine teams sitting between second and 10th in the table. Sleaford Town Reserves remain clear leaders, despite having a day off. 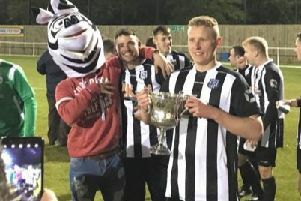 They are 10 points clear of Cleethorpes Development Squad whose victory in Group A of the Supplementary Cup knocked Skegness United out of the competition. Wyberton missed a chance to go second when they were held to a 1-1 draw by Horncastle Town at The Causeway. Skegness Town occupy fourth spot after completing a league double over champions Hykeham Town. The Supplementary Cup tie between Ruston Sports and CGB Humbertherm was postponed as the Therm were unable to raise a team.